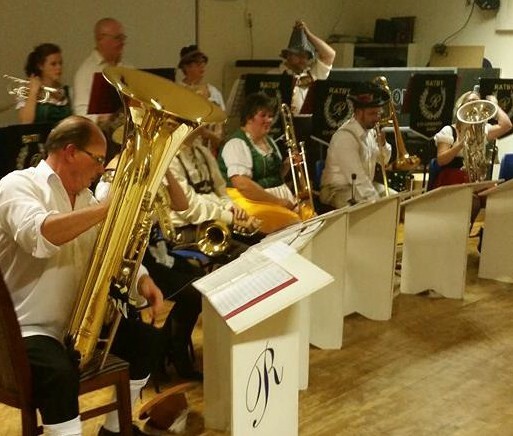 The Ratby Co-operative Band Organisation is a versatile one, and a small group of Senior Band players have for the last few years performed a number of Oompah or Oktoberfest evenings, showing how versatile the brass band can be!! Nicknamed the ‘Ratby Stompers’ this small group of lederhosen and apron-clad musicians are a lively bunch, led my Steve (Stan) Alexander on the microphone and soprano cornet (not at the same time) and backed up by his trusty bunch of pilsner suffering maidens and gents. As well as a fine array of oompah-style numbers, ‘Stan’ has been known to liven up the audience with a few musically-accompanied games to get your party in the mood. If you think the “Ratby Stompers’ would be suitable for your event, please get in touch. Prost! (Cheers! ).